To Enquire - Click Here Now ! For Jardines Gallery Click Here ! Costa Del Sol vacation townhouse Jardines Del Golf is a lovely modern, bright and airy house which can sleep up to 8 persons. It is located close to Duquesa golf course and the lively marina with a choice of beaches all within walking distance. The property is in a quiet location with large private terraces as well as a large garden area, but is only a few minutes walk from the beautiful European Union Blue Flag Beaches. To Enquire about Jardines Del Golf Click Here ! The house is furnished to an extremely high standard and the accommodation comprises of 3 bedrooms and 2 bathrooms (master bedroom ensuite), as well as shower-room; there is also an additional room on the top floor with adjoining roof terraces with sun loungers. The open plan first floor consists of a TV lounge, dining area and sitting room and has for your entertainment TV, VCR, SKY access and CD/radio/cassette player. The lounge leads on to an attractive large south facing private patio that has sun beds and a shaded dining area. There is also a gas barbeque on this patio, which as it enjoys direct sunlight until approximately 9.30 p.m. every evening, makes it ideal for dining al fresco in the evening. Dining alfresco is part and parcel of life on the Costa Del Sol. The sitting room leads to the rear patio, which is also furnished and backs directly onto the large private gardens. This patio area is excellent for enjoying breakfast on as it captures all of the morning sunshine. Both patios have night lighting systems. The modern kitchen is fully equipped with electric oven and hobs (stove top), microwave, fridge/freezer, washing machine/dryer, dishwasher and a comprehensive range of kitchen utensils. The split-level communal pool is 20 metres from the house, and is fully equipped with loungers and chairs. The beaches are just a 5-minute walk via a footbridge, there are no major roads to cross ... take a stroll down the beach to the Chiringuitos that serve mouth-watering seafood. Costa Del sol vacation Duquesa Marina is a further few minutes stroll along the the sea front offering an exceptional variety of restaurants, bars and cafes. A further five minutes walking takes you to the beach promenade of Sabinillas, filled with restaurants and tapas bars. Sabinillas is a vibrant and friendly place, giving visitors a taste of the real Spain, a real Costa Del sol vacation hideaway. The Duquesa area is commonly known as the new golden mile, and is favoured because of it’s mild climate and easy access to several nearby places to visit. 2 minutes walk. Duquesa Golf/Country Club, a great golf vacation spot: gym, indoor pool, tennis courts, restaurant and bar. 10 minutes walk. Duquesa Marina: large variety of restaurants, cafes, bars, shops. 15 minutes walk. Sabinillas: large variety of restaurants, cafes, bars, shops, beaches, beach promenade, Sunday market. 10 minute drive. 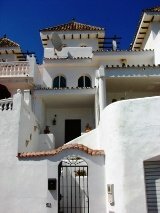 Estepona: old town, shops, bars, port/marina, beaches, beach promenade. 10 minutes drive. Sotogrande: beaches, golf, marinas. 15 minutes drive. Selwo Park, African adventure theme park, wild animals, rides, activities, a great family day out. 20 minutes drive. Puerto Banus: marina, bars, restaurants, and beaches, shopping. 20 minutes drive. Gibraltar: Shopping, sightseeing, bars, restaurants, beaches, waterpark (Alcadesi), Gibraltar Airport. 25 minutes drive. Marbella, old town, shops, bars, port/marina, beaches, beach promenade. 45 minutes drive. Malaga Airport.